Cascading jewels were the inspiration for this art-nouveau design. Garments are cut-velvet in rayon and silk, designed by Marian and woven in France. Designed by incorporating the style of vintage Italian lace, Marian included the added adornment of airbrushing in antique gold or silver. Lace imported from Italy, viscose and cotton blend. From Imperial Russia comes the look, from Italy comes the richly printed velvet. 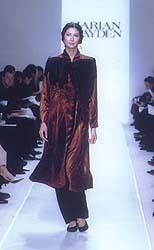 Using silk and cut-velvets, in her classic designs, these garments have become her signature look.